Highly efficient recycled air drying system consisting drying chamber fitted with nozzles of high velocity centrifugal fan is provided. Finest screen on analox roller which ensures minimum consumption of ink & sharp printing. In feed system transmission through V – belt which helps to maintain tension continuously printing stations. SSMECH Flexographic Printing Machine is designed and developed to achieve high standards in flexible printing. It’s state–of–art technology offers freedom to carry out even difficult jobs. This flexo printing machine is fitted with helical gears which ensure fine longitudinal and horizontal registration at all speed levels with smooth run. The maximum printing Speed of this Flexographic Machine is 90 Mtrs./Minute. 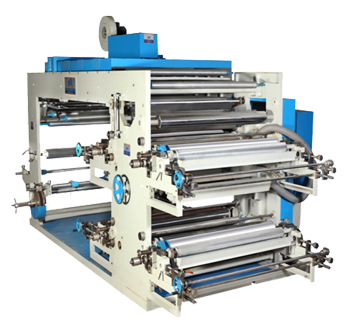 SS mech is one of the leading Flexographic Printing Machine Manufacturers since 1980. Printing of HM/HDPE/LDPE/PP/Polythene Polyster, BOPP etc.